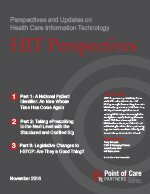 HIT Perspectives is POCP’s account of top health IT trends, significant healthcare events, federal policies and industry activities. Each article provides analysis and insights based on POCP’s unique views and indepth expertise on cross-cutting issues affecting payers, pharma, vendors and providers. Connecting Patients With the Costs of Their Medications | High Impact: Opioid Legislation Effects ePrescribing, ePA and PDMPs | Looking Back at 2018 Predictions: How’d We Do? Improving Drug Price Transparency: The Case for Out-of-Pocket Drug Cost Information at the Point of Prescribing | NCPDP Forms Specialty Pharmacy Work Group |Thumbs Up at this ePrescribing Checkpoint! A National Patient Identifier: An Idea Whose Time Has Come Again | Taking ePrescribing to the Next Level with the Structured and Codified Sig | Legislative Changes to I-STOP: Are They a Good Thing? HIMSS15: On FHIR and 6 Other Key Takeaways | The Impact of MU Stage 3 on Patient Engagement | Meaningful Use Stage 3: What Does It Mean for EHR Vendors?